I’ll admit it. I am inordinately attached to a specific bowl, which I prefer to use for cereal and ice cream. Try as she might, Cyndie has been unable to get me to give up the remaining pieces of our original (old) Midwinter Stonehenge Wild Oats pattern dishes from over 3-decades ago. What can I say? If I still had any of the Melmac dishes from when I was a kid, I’d probably be using those, too. I stick with what works for me. That is, until I spun the big chair up in our loft, tipping the side table, knocking the last remaining bowl from that Wild Oats set crashing to the floor in pieces. It was heartbreaking. My last bowl. Gone. Now, how silly is it to get so hung up on one specific bowl? I have used others. Since there had been only one Wild Oats bowl left, there were plenty of times when I would open the cupboard to find Cyndie had used it and it was in the dishwasher waiting for the next wash. I would give in, and take an alternative. All that would do for me was re-confirm that substitutes don’t cut it. That style of bowl has always been my one and only favorite. But now the last one was gone. As I was lamenting the sad occasion, Cyndie suggested I try one of the “green” bowls. It was sweet of her to offer, but those bowls are so not my bowl. They are way too wide, and therefore, the capacity is too much. Their shape, too gradual a slope. It’s like a plate, with the outside edges raised up to form the vague shape of a bowl. One more time, Cyndie tried to help. She suggested I search online for the pattern. “You can do that?” I said. You sure can. God bless the internet. Replacements, Ltd. performs miracles. They “replace the irreplaceable.” Who’d a thunk it? I will be eating breakfast this morning out of my “new” cereal bowl. It is the perfect shape. The perfect size. The perfect weight. I’m no dummy. I ordered two. 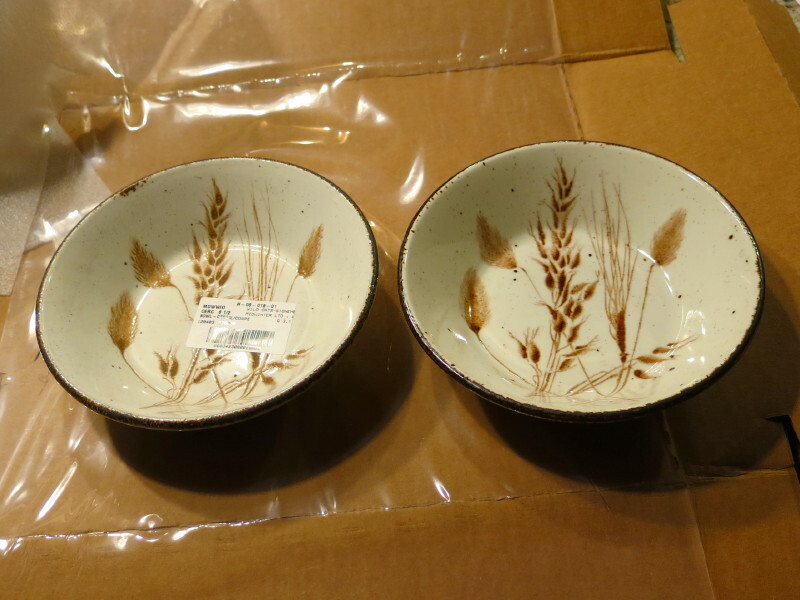 It is interesting that the 2 bowls they sent have different appearances. They each have characteristics that appear to match our originals, but one of them looks much more like a copy. The print is nowhere near as crisp. But, they are the right shape and size, and that is most important of all. The pattern is secondary; soothing to my penchant for familiarity. It’s like being in the year 1980, every morning! Bring on the Shredded Wheat! So….you must put the Grape Nuts on your ice cream….I’m certain you must have them in your cupboard? Yes! Why, it’s as if you have known me all my life. I loved this post. It is a bit in line with the idea – if it isn’t broken, don’t fix it. The truth is that there are things and processes that are tried and tested in this world and work wonderfully well. And yet, for the sake of newness or novelty, people will seek to change them and often end up with something far more expensive, inefficient and down right wasteful. Yes, at times, people lose touch with what really works and then pay an enormous price. Ian, we are brothers, indeed.